Although this was the final cinema screening this season, if you're in the UK you can still catch live action from the Royal Opera House at BP Summer Big Screens. Tonight, John Copley's much-loved production of La bohème will be screened live in 22 different locations across the UK. Find out where your nearest screening is. Saw the cinema broadcast of La Fille mal gardee last night in Ludlow, Fabulous production. Inspired idea to screen around the world.Looking forward to the next. This was such an amazing performance all round is there any chance it will appear on DVD? A brilliant transmission with excellent camera work; but how embarrassing to have people's tweets on-screen. Absolute perfection! wonderful dancing by superb cast. Lovely to see Lesley Collier coaching and remembering her as Lise. Pleeeeease consider a DVD of this performance. It was absolutely magical and Angela and I could never tire of watching it over and over - whilst waiting for the start of winter programme!!! The concept of ROH Cinema is absolutely brilliant and has brought a whole new dimension to our growing love of ballet. Really loved the live relay last week - it's my favourite ballet anyway (and good to see Lesley Collier coaching). Especially enjoyable to see the acting as well as the dancing. Noting your response re a DVD, is there a possibilty of making it available as a download - for a fee of course? I do urge that. 2. The effect of being present in the opera house was spoilt by the camera tricks - changing camera angles and closeups (revealing the stage makeup to disadvantage). We thought a single fixed camera, without zoom, would be more appropriate. 3. The aspect ratio was wrong! Stretching the image lengthways to fill the screen is absolutely not acceptable - everyone looks broadened - and for me, that makes it painful to watch. (Particularly unfortunate for ballet!) I would be very interested to know which standard you were using. I take it that you follow one of the 4 DCI formats: 2K or 4K, 2.39:1 (Scope) or 1.85:1 (Flat). Could it be that you wrongly coded a FLAT format as SCOPE? Or should I assume that the projection equipment at the Picturedrome was wrongly set up? (The picture as projected was more than twice as wide as high, perhaps around 2.1 or 2.2:1. Was this supposed to be a compromise, I wonder?) In either case, it reflects badly on the ROH and you need to fix it. I would appreciate a respose, in particular to item 3. Many thanks for your thoughts on the relay of La Fille Mal Gardee. The aim of the films preceding the performance coverage is to introduce and provide background information on each production. 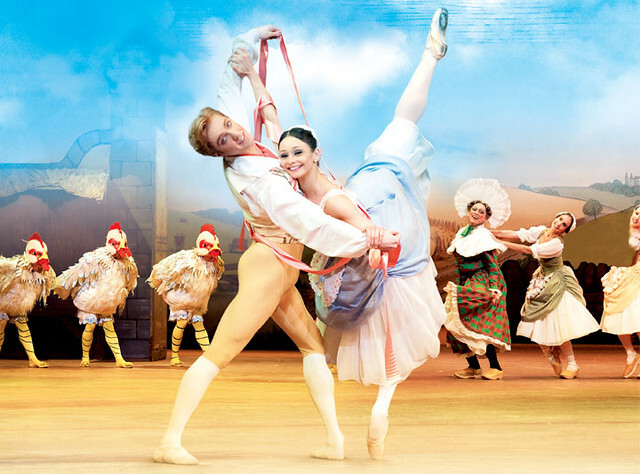 They also give the cinema audience a rare opportunity to glimpse behind the scenes at the Royal Ballet and to see the effort that goes in to preparing each production. I’m sorry that you found them unnecessary. The performances are up to three hours long so we feel it appropriate to offer our cinema audiences the same intervals afforded to the Royal Opera House audiences. The use of multiple cameras allows us to bring more of the action and spectacle to the cinema audience. We can show much greater detail in facial expression, gesture, costume, make up, props and set alongside wider shots of the whole set and cast. We employ some of the best directors in the world to bring each production to the screen and the shots are chosen extremely carefully so as to enhance and not deter from the drama. We're sorry to hear that the cinema did not follow how very precise instructions to set up the aspect ratio on the screen properly. We provide three different tests prior to any live event during which the cinemas are coached through the steps of setting this which of course if done incorrectly really spoils the experience particularly with ballet performances. There is absolutely no reason why any cinema would show our live relays in this manner and we will advise the cinema of this immediately. So much fun to see here in Maine! Loved it...can't wait to see the next one! Also, loved the glimpse behind the scenes...amazing to see all the hard work....thank you!